It was probably right around the time that President Barack Obama, in his Inaugural Address, was telling Americans, "There's nothing so satisfying to the spirit than giving our all," that Meg Sommerfeld '90, who was watching the event on television with neighbors, could relax and catch her breath for the first time in a week. And feel very satisfied, indeed. concert at Calvary United Methodist Church in Arlington, VA.
She'd just coordinated a large-scale Dartmouth alumni volunteer housing effort; helped stage a performance by the 80-member Dartmouth College Gospel Choir; and hosted in her home two choir students, whom she'd taken to the Metro station at 4 am to join the masses of people heading to the Mall for Inauguration ceremonies—none of which she knew a week earlier she'd be doing. On Monday, January 12, Sommerfeld and husband Jay Matson '91 had just returned from a weekend away to their home outside Washington, DC, to find an email saying that the Dartmouth College Gospel Choir, led by Walt Cunningham, was traveling to the city to perform at an Inauguration event at the National Building Museum on Sunday. About 30 choir students needed places to stay. Could she help? Yes, she could. Armed with the large Dartmouth Club of Washington, DC, email list and jumping into organizer mode, Sommerfeld got the word out to alumni that volunteers were needed to host DCGC students, and she asked everyone to host at least a pair. In a few days, working with Louisa Thompson '08, former choir member, and Steve Donovan, regional affairs director in Alumni Relations, she'd lined up enough alumni to house all the students. John Hanley '71 and his wife, Debra Hanley hosted Dartmouth Gospel Choir members Ashley Augustin '12, Perry Bradford '12, Arielle Cannon '12, and Natasha Herring '12. In addition to picking up the students Sunday morning, after the choir's performance at a private Inauguration event; taking them to see a movie; and spending some time together, the Hanleys attended a public performance the choir gave at a church on Monday. "Although I wish I'd had more time to invite friends to the performance," says Hanley, "the church was nearly full. After introductions by the pastor and Meg Sommerfeld, Walt Cunningham and the choir gave us a sample of what we were in for, and they told us a bit of their story. "The performance that followed was one of the transcendent moments of the Inauguration. I appreciated that these young ladies were already accomplished, or they would not be Dartmouth students. But Debra and I weren't prepared for what they gave us. On the way home, I told them, in so many words, that they needed to be cautious as they reached so deeply into the souls and psyche of their audience. They could not touch us so and not be members of our family." Most people would give themselves a well-deserved pat on the back and leave it at that, but Sommerfeld was just getting going. "I got a bee in my bonnet," she says, to see if she could arrange for the choir to give a public performance after its Inauguration performance, which was at private event for the Inauguration Finance Committee. "I've seen the gospel choir perform before, at Club Officers Weekend in Hanover, and I know how great they are," she says. "I thought, what's the chance we could find a place that could hold an 80-member choir?' I just had to try." Brainstorming together, Sommerfeld, Caryn Ginsberg '83, and Dartmouth parent Tommye Grant contacted theater spaces, firehouses, schools, and more venues, looking for a space that was large enough to hold the choir and located near a Metro stop, so that the students could reach it. Somehow by Friday afternoon, in the midst of a city engulfed by Inauguration preparations, they managed to find just such a space: the Calvary United Methodist Church in Arlington. "We all wanted to do a second, public performance," says Joshua Kol, director of student performance programs at the Hopkins Center for the Performing Arts, who traveled with the choir. "I always try to do stuff like like this for the choir, and I've sometimes worked on short notice, but this was probably a record. Meg is quite unbelievable in her energy and excitement—she's a do-er." 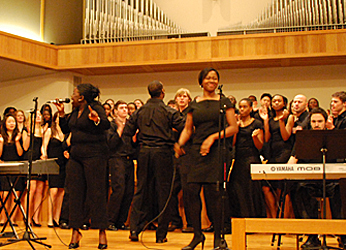 About 150 people—Dartmouth alumni, other Ivy League alumni, church members, and people from the neighborhood—attended the concert, at which the choir performed many of the numbers they'd performed at the Inaugural event, as well as other songs, including an impromptu version of "Let's Set the Atmosphere." "It was really fun," says Sommerfeld. "The choir had a lot of people clapping and dancing, and they got a standing ovation. And the church ladies surprised us by bringing all kinds of food and supplies, right down to the punch bowls and napkins." Everyone had a sense of the import of the moment, says Sommerfeld. "It was great to celebrate Martin Luther King Day and the Inauguration in this meaningful way." In addition to Sommerfeld and Ginsberg, who hosted four students between them, the following alumni opened their homes to the choir students: John Hanley '71, Cheryl Newman '76, Arthur Lewis '66, Steven Stichter '86, Kristina Kohler '87, Doug Rice '79, Bob Baum '77, Jake Gillespie '61, and Richard Tufaro '66. Deborah Klenotic is the editor of the Alumni Relations Office Web site.